It must be that time of year as Mario ventures once again into the colourful depths of the Mushroom Kingdom. Coming exclusively to Nintendo’s Wii U it’s obvious that there are going to be a few major changes to the beloved series. However with the latest installment in the series, “New Super Mario Bros 2” releasing on the 3DS recently it begs the question: are we really getting anything “New” or is it a term that Nintendo is using just a bit too often? Mario’s latest adventure sees our famous plumber heroes Mario and Luigi, as well as some new friends–blue and yellow versions of Toad–having lunch at Princess Peach’s castle (sounds peachy right?). As per usual Bowser turns up way before all the sausage rolls are gone, however this time he’s flying an airship that has a giant fist attached to it. This launches our heroes and toads into the Acorn Plains, unleashing super acorns throughout the area. 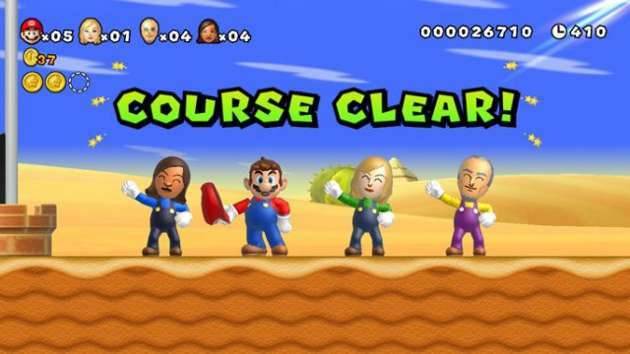 To sum up–Bowser gets cosy with the princess and our heroes must save her. One obvious change in this trailer is the graphics, which look absolutely spectacular. The game still retains its cartoon style however this time it’s in HD and it makes a world of a difference. Another key thing to note graphically is that the game truly reflects Nintendo’s playful and creative side, with colour palettes that complement each other and characters that now appear to stand out. Another big change would of course be the addition of a new power-up, the Super Acorn. This grants Mario the power to hover in the air for a very short time. If that sounds familiar to Mario fans that’s because it is–Super Mario Advance 2 features a feather that allows Mario to hover for a short period of time. Whilst the super acorn is a new power up in its own right, it does feel like it’s been done before; the only difference is this time Mario is dressed as a squirrel. The addition of several different coloured Yoshis is intriguing, with each Yoshi possessing different powers that will be helpful to players as they progress. Of course in true Nintendo fashion these different types of Yoshi are identified by specific colours. Yellow Yoshis emit light, blue baby Yoshis can blow bubbles and magenta Yoshis can blow up. These Yoshis, whilst being slightly unique, resemble the Super Mario Galaxy 2 Yoshis just a little too much. One brand new addition of course is the ability to play as you (so to speak), making the Mario magic feel a little bit more real. Whilst there is no advantage to playing as your Mii, it is a nice touch and does bring with it some interesting features. It appears that players will also interact with other players across WI-FI, through a kind of a world map. This map shows that people have posted “Statuses” with their opinions to certain levels. Their clear time is shown as well, meaning that players will possibly be able to compete with each other in order to beat clear times. Also confirmed are a few new modes, one of which utilizes the Wii U’s game pad. 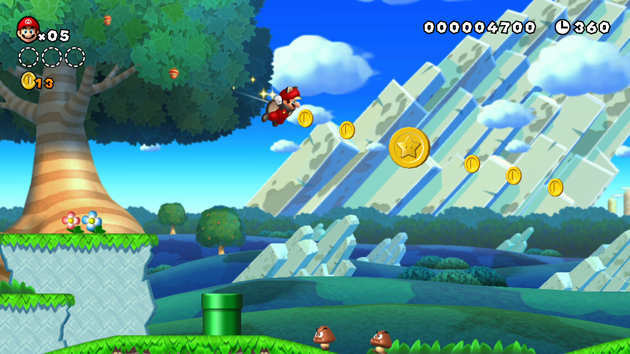 The new mode is titled “Boost” and will allow five players to join in with Mario’s classic adventures. How this works is that the fifth player is using the Game Pad to place blocks in order to assist the other players. This serves particularly useful for players trying to move fast, reach high areas or who are about to plummet to their doom. The second new mode for players to have fun with is called “Boost Rush” and it truly sounds interesting. 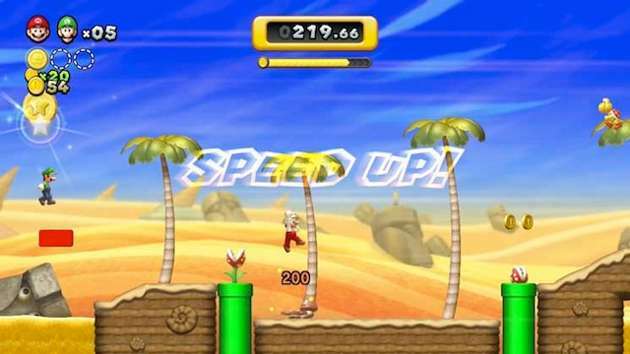 This mode will transform any given level and make it auto-scrolling; this speeds up time and ultimately allows players to compete for a top speed run. The last mode sees players jumping repeatedly on enemies in order to collect as many extra lives as they possibly can in an all new challenge mode. What’s interesting about this mode is that is seems to make the game a little unique, as most of the modes featured are new for the game. New Super Mario Bros. U is set to release the day of the Wii U launch, November 18th 2012 and could be the Mario game that defines the classic series forever.